Syracuse and its devastating 2-3 zone are headed to the Final Four. And for an old-school defense, it's really something else. Long after the East Regional finals were over, and Syracuse had managed to hold Marquette to a point total that would have been pyrotechnical in, say, practically every Rose Bowl ever played, former Georgetown coach John Thompson Jr. was holding forth in a hallway of the Verizon Center in Washington, D.C., not far from the Orange locker room. “Everybody’s talking about the 2-3 zone,” Thompson said. “That’s not a 2-3 zone. The 2-3 zone has been with us since the dawn of time. It’s the way it slides and moves out there, like a damn amoeba. It is as old-school as it gets — the defense that every Y league team puts in when its roster gets too old, or too fat, or too lazy to play man-to-man anymore. It’s the first defense besides the man-to-man that young players ever see, or that they learn to play. In the hands of Syracuse, though, especially this Syracuse team, it is like seeing something you’ve become accustomed to grow deadly all at once. It’s like walking into your front yard and discovering your garden hose has become a Gaboon viper. Yet another 1-seed found an early exit in the tournament Thursday night. 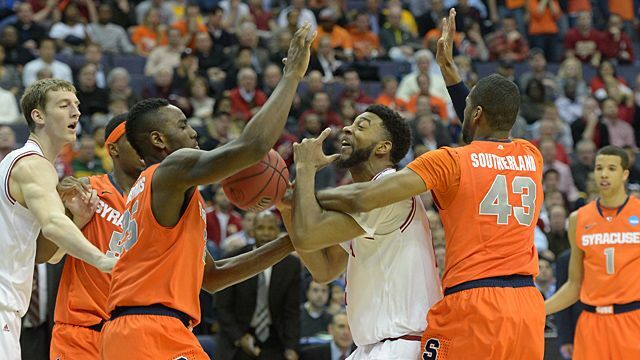 This time, it was the Indiana Hoosiers who met their fate at the hands of the Syracuse Orange and their famous 2-3 zone. Saturday’s 55-39 win over the Golden Eagles that sent Syracuse to the Final Four wasn’t the real masterpiece, however. That was the regional semifinal game on Thursday night, when the Orange sent Indiana spiraling so deep into utter futility that the Hoosiers ought to be running into the NCAA Enforcement Division any day now. The third-highest scoring team in the country shot 33 percent from the floor Thursday, including 20 percent on its 3-point shots. The Hoosiers committed 18 turnovers and barely made it to 50 points. Indiana center Cody Zeller looked particularly lost, and he probably should not consider attending the NBA draft this June unless he’s in New York anyway to see a show. Of course, continuing your career as cheap labor in a $771 million industry is to make a devil’s bargain with yourself. Indiana was lost. Indiana was confused. Every time an Indiana player drove to the middle, the lanes around him closed in on every side. Every time an Indiana player looked to make a pass, he hesitated for a palpable second, and then the alley would close up again. Every time an Indiana player caught the ball on the perimeter, you could see him juggle it for just a second, as though it suddenly had become hot to the touch. You could see uncertainty and doubt creep over the Hoosiers at some point in the middle of every possession. With Marquette, a manifestly less-skilled offensive team, all of these problems were made worse by an order of magnitude. Junior Cadougan, the Golden Eagles point guard, was forever making jump-stops into the lane, only to disappear entirely in what appeared to be a small forest of arms. To be sure, Boeheim has put together a roster that is uniquely suited to the defense that you will have to pry from his cold, dead hands. “It is the zone,” said Marquette coach Buzz Williams. “And it is the players in the zone.” And Carter-Williams is the key to it. Playing at the top of it, sliding side to side, he has a great deal of the feature currently most beloved of the TV chattering classes — “length.” At 6-foot-6, Michael Carter-Williams has great “length.” It means his arms are really long. To appreciate how Syracuse has refined its zone, you have to watch at courtside when it’s working at its highest level. It almost looks choreographed. You can see two men slide, and then two men slide over behind them, and, anytime a slice of daylight appears, there’s an arm and a hand there to block it. The traps come suddenly, and from all angles, and with startling speed. You never get two identical looks from the zone on successive possessions. It is a simple defense played within a universe of creative variations. The movements are so precise, and the results so thorough, that the Syracuse zone has unique effects on the game completely missing from any other team that plays this most basic of defenses. Usually, teams facing a zone play patiently, and the game slows to a crawl. However, teams facing the Syracuse zone seem to lose their minds, cranking up the tempo to a preposterous pace. Indiana rushed everything in the first half, and it never settled into any kind of rhythm. Sooner or later, you just look desperate, which means you feel desperate, which means you are. Moreover, and perhaps as a function of this counterintuitive effect on the game, Syracuse’s zone turns the other team over at a rate common to most teams that press full-court. For the life of me, I can’t understand why Syracuse doesn’t market this whole thing to the basketball nostalgia crowd. This is a team that’s had the same coach for going on four decades now. (By contrast, Steve Alford enjoyed his massive extension at New Mexico for about four minutes before beating feet to UCLA.) It plays this rinky-dink defense that every couch potato watching the game plays on Saturday in the weekly coronary-artery demolition derby. Those people? The ones who are bored by dunking, and convinced that it all went to hell in a handbasket when Earl Monroe’s talents made the rule against palming irrelevant? They should eat this up with a spoon. It’s old and new all at the same time. You know what’s great about the Princeton offense when Georgetown runs it? The people who watch it for the back-screens and the moving-without-the-ball get to see what they like and yet, given that Georgetown recruits better athletes than Princeton does, when the Hoyas run the thing, all the back-screens and moving-without-the-ball can result in very impressive dunks. Everybody wins. Why can’t the Syracuse zone become the defensive equivalent of the Princeton offense? It’s just as old-school, but it also often results in steals at the top of the lane that turn into very impressive dunks in transition. Again, everybody wins. The purists and analysts can talk about movement and communication and sealing the post. And the rest of us can watch Carter-Williams or C.J. Fair pick some dude’s pocket and go flying in the other direction. And it’s going to be a running Final Four. Watching Wichita State try to handle the relentless Louisville pressure will be one thing, but watching Michigan’s Trey Burke — the player of the tournament so far by an almost ludicrous margin — see this zone for the first time will be another. I guarantee you that at least a couple of Burke’s teammates are looking at the scouting report and wondering what the big deal is with a team that only plays a 2-3 zone. Hell, everybody plays a 2-3 zone. And the Gaboon viper awaits, coiled on a hook in the garden.